I hope that my title expresses how much I love the show Dorm Life. Because I love Dorm Life. I love it. LOVE it. It is the most watched web-series on Hulu. Dorm Life is a mockumentary about the students who live on floor 5 South. It was created by former students of UCLA. The show is like The Office, with a little Jim-Pam romance, and some crazy characters (omg the RA!). If you ever feel like you miss college, this will take you right back! There are only two seasons and the episodes are five to ten minutes long. Get started today!!! 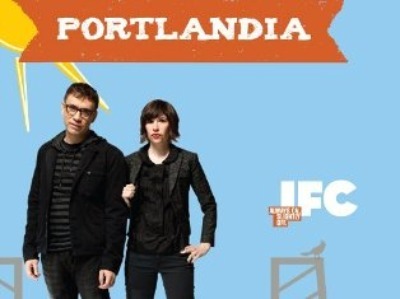 Portlandia is a fantastic sketch comedy show on IFC starring Fred Armisen and Carrie Brownstein. The second season just started and we are in store for ten episodes as opposed to the first season’s six. The first season is available on DVD or from itunes or most of the episodes can be pieced together from the clips on Hulu. Even if you have never been to Portland (I haven’t), you will love this show. It is like the best sketches from SNL + a dash of familiar weird people + hippie/hipster mocking = HILARIOUS! Carrie and Fred play versions of themselves and lots of other reoccurring characters. Each episode has one main story broken up into three or four parts with other sketches throughout. They are going on a live tour (yay!) and you can check out the dates here. I recently heard Carrie and Fred on Fresh Air with Terry Gross. Did you know Carrie Brownstein used to write a music blog for NPR? Portlandia is a comedy home run and I look forward to catching up with the mayor, Toni and Candice, and the wonderful city of Portland!